Where Do I Begin? We understand that moving is a stressful time. Just remember the end result is you being settled in your new home at The Fountains! Our goal is to be with you every step of the way. Let us come to your home and measure your furniture and develop a floorplan for your new apartment. This is a complimentary service that we offer to help with the move in process. Our marketing staff will also help you coordinate all the necessary resources such as realtors, estate sale companies, moving companies, and customize a moving plan that is just right for YOU. We even have a service that helps with the unpacking of your belongings on moving day. Ask us for details! Moving is never an easy thing to do. Don’t allow yourself to become overwhelmed with the idea of it. 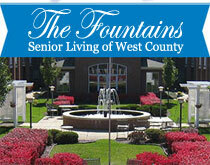 Take advantage of the experience and expertise of The Fountains marketing staff. We will lift the stress off your shoulders and help make this a positive and smooth experience. We’ve done the homework for you. Just stop by our office for an updated list of preferred providers in Realtors, Moving Companies, Estate Sales, eBay Sellers, Estate Auctioneers, Local Area Donation Companies and more. Find out how we can become that special place you call home.